Very nice hostel with relaxed and helpfull staff. Rooms are great, had a lovely stay! 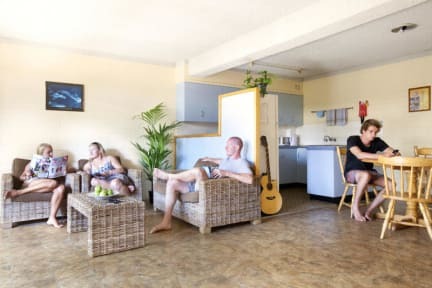 Amazing hostel with a real great surfers vibe. Nice spacious kitchen and showers and toilets regularly cleaned. The BBQ one a weak is a great party with more than the normal sausages on bread. You get burgers and a whole array of sides and sauces. Free surfboard hire is a plus even though it is a 15 min walk with the board to the beach. I really liked this hostel. Good location. It's easy to make contact with people because there is a long table where everybody eats. The kitchen is clean every morning and the floor of the showers also. It didn't look like they cleaned the toilets often. Wifi only at reception. Fan in room makes a lot of noise. The only things that could have been better.. Stayed in the apartments and luckily had very nice roommates, really depends on that. Kind of silly that there's no free wifi and you have to put a deposit down for plates and cutlery. Other than that good hostel, pretty good distance from the beach and shops. Supermarket really nearby. Holiday village was a good hostel in my opinion. I spend 3 nights there and we got our own little 'appartment', which contained two dorms. It came with an ensuite bathroom, kitchen and living room. The place got cleaned every day. You can also borrow bikes for free within the hostel, which was really nice. On the other side, the place isn't really quiet at night so we had some trouble sleeping (also because we shared our dorm with some English guys from Newcastle who went out every night). Good hostel a bit far out of the city. Only stayed for one night, so I couldn't really form an opinion.